OTTAWA – In the bowels of Canadian Tire Centre late Tuesday afternoon, assistant coach Steve Smith retrieved Will Borgen from an adjacent room and turned the hallway outside the Buffalo Sabres' dressing room into a makeshift classroom. With only a few hours to prepare Borgen for his NHL debut against the Ottawa Senators, Smith set a white board on top of a high-seated stool and sketched out a few teaching points about the Sabres' structure. Borgen, a 22-year-old defenseman, was eating breakfast less than 12 hours earlier when he was told of his promotion from Rochester. After a five-hour car ride and no morning skate, Borgen had only a few hours to physically and mentally prepare for his assignment of filling in for Rasmus Ristolainen, who fell ill and was unavailable for the first time this season. Borgen, who was paired with Marco Scandella against the Senators, was an ideal fit to fill in since he is a right-shot defenseman like Ristolainen, however, the former fourth-round draft pick also earned the opportunity by flourishing with the Amerks. Borgen has two goals with 10 assists with a plus-7 rating in 66 games during his first full season with Rochester. He began his professional career one year ago, following three seasons at St. Cloud State, and became the second defenseman in three days to be promoted by the Sabres. Lawrence Pilut joined the team Sunday in Newark because neither Zach Bogosian (lower body) nor Matt Hunwick (upper body) would be available to play in the Sabres' 3-1 loss to the New Jersey Devils on Monday. Pilut, 23, played 20 minutes, 42 seconds and had three shots on goal against the Devils – his first NHL game since Feb. 19. Ristolainen's minutes have dropped over his last three games, he played only 20 minutes, 3 seconds against New Jersey. With Bogosian and Hunwick unavailable Tuesday in Ottawa, the Sabres called upon Borgen, a defensive-minded prospect whose stock rose by finishing checks and playing with the type of snarl Buffalo has lacked for much of the season. "Will brings a physical element to the game," Sabres coach Phil Housley said. "He’s a shut down guy, plays very well in his own end. Defensively, boxes out tremendously well. Plays a simple game. Makes that first pass on the tape and that’s what we’re looking for tonight." While the Amerks and Sabres run a similar defensive structure, Smith had to quickly teach Borgen the team's tendencies on the penalty kill while going over a brief game plan on the Senators. There were also conversations with the equipment staff and teammates, many of whom he had not played with since the preseason. 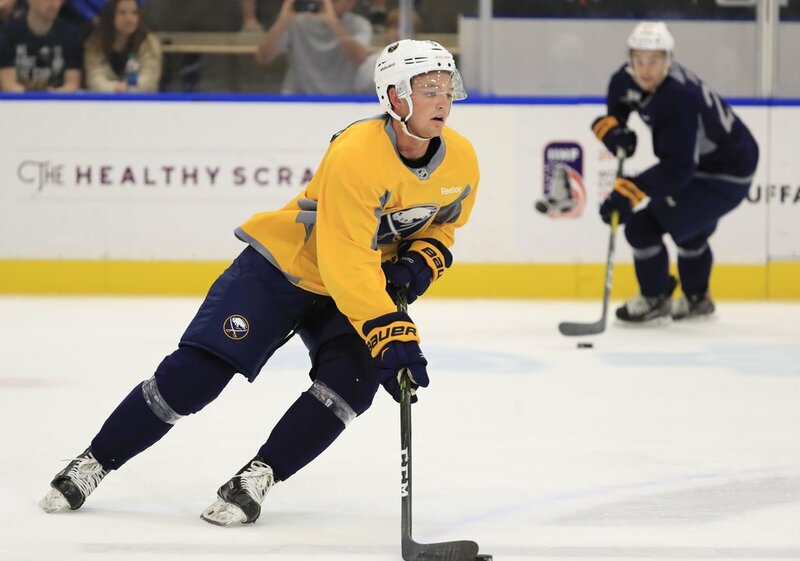 Housley expressed excitement for watching another prospect join the team, adding that Borgen's enthusiasm could "rub off" on the Sabres. It is unclear how long Borgen could stay – after all, Alex Nylander earned a full-time role during Jack Eichel's suspension – but he doesn't intend to change what earned him that call from Taylor. Casey Fitzgerald, a 22-year-old defenseman, signed a two-year, entry-level contract with the Sabres on Tuesday and will report to Rochester on an amateur tryout. Fitzgerald had 17 goals and 65 assists in four seasons at Boston College, serving as team captain in his junior and senior seasons. The right-shot defenseman was a third-round draft pick of the Sabres in 2016 and won a gold medal with the United States at the 2017 IIHF World Junior Championship. His contract won't begin until next season. Casey Mittelstadt spent only one game as a spectator in the press box. The 20-year-old center was back in the Sabres' lineup Tuesday night after he sat out against the Devils. It was the first time the rookie had been a healthy scratch and only the fifth game he had missed all season. Vladimir Sobotka, who has five goals among 13 points with a minus-19 rating in 68 games this season, was a healthy scratch against the Senators after he was called for two minor penalties Monday in New Jersey. Sabres General Manager Jason Botterill is joining former Carolina Hurricanes General Manager Ron Francis and former Philadelphia Flyers General Manager Ron Hextall on the management team for Canada's 2019 team in the World Championships. The tournament will be held May 10-26 in Slovakia, and will also involve former Sabres captain Chris Drury, who was named the general manager for Team USA.